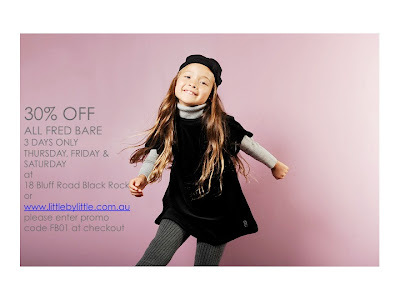 We have decided to reduce ALL the Fred Bare winter range by 30% OFF for 3 days, Thurday, Friday and Saturday. A great time for our lovely customers to stock up and buy the winter essentials for their little blossoms! The sale is both in store and online, just enter promo code FB01 at checkout when processing your order online!